Txais tos kom rov qab zaj dabneeg, Part 3. Ntawm kuv - my rehabilitation continues and I am seeing improvement, which is welcome, but not always pleasant. As I start getting feeling back in an area, it is usually pain that I feel. I've had a lot of pain related to a very tight piriformis muscle in my right hip. I've had exercises and stretches for it, which have helped some. As some other pains have subsided, it is time to concentrate on the biggest pain I feel right now and that is at the top of the hip on the back side. It comes from a knotted up, top end of the piriformis. Monday at Physical Therapy, my therapist took about 5 minutes to do a deep muscle massage of that spot. It "hurt good" the whole time. A few minutes after the massage, the pain decreased to nothing. I had much better mobility, no pain from walking or sitting! Monday and the first 1/2 of Tuesday were great. Ces, of course, the muscle started tightening again. Thursday I have my next PT session. Kim is going with me and my therapist, Carrie, is going to show her where and what to do. During the relief from this pain, I need very little pain medication. Now that is a goal I'm looking for! I'm working 1/2 time right now, and with the PT and still rebuilding stamina, that works good for me. I will stay at 1/2 - 3/4 time a few more weeks then try to make it back to full time. Sitting - still tough to sit for long. Some chairs I can last an hour, others 10 minutes. And how long I can bear to sit in which chairs changes from day to day. Walking (with cane) - I can now walk short distances (<50 feet) with a cane. Very tiring to do so, so I don't do it much. Therapist recommends 3 short cane walks a day. Walking (unassisted) - I can walk very slowly, make dead sure of my balance for each step, for a distance of 5 - 8 feet. This is new. Summary - progress being made, a long way to go yet. Keep on praying for Kim and me as there are still other issues from the cauda equina syndrome which are likely to never get back to normal and affect everyday life. These are the toughest as there is no treatment available for these issues, it is just up to the Lord whether the nerve damage heals or not. Our hopes and faith are in Vaj tswv's hands. Praise be to God for His blessings! Ntawm kuv - Well today is a sad day of sorts. 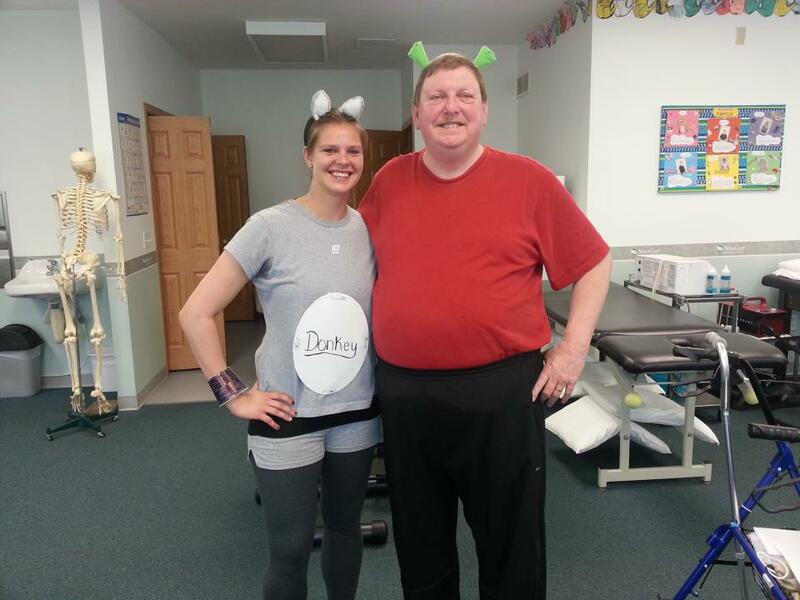 It is my physical therapist's last day here in Ohio. She is a Doctor of Physical Therapy student who has been doing her final internship at NovaCare in Westerville. After today, she will be finished and headed back to Buffalo, NY to graduate. Congratulations, Carrie!